A character Model generally consists of polygons in 3D modeling software or converted to polygon or triangulated mesh, from a more complex mesh type before export. 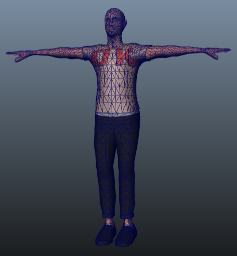 In order to control the movement of a character, you must create a joint hierarchy or skeleton which defines the bones inside the Mesh and their movement in relation to one another. The process for creating such a joint hierarchy is known as rigging. You must then connect the mesh or skin to the joint hierarchy. This defines which parts of the character mesh move when a given joint is animated. The process of connecting the skeleton to the mesh is known as skinning. Use a procedural character system or character generator such as Poser, Makehuman or Mixamo. Some of these systems can rig and skin your mesh (like Mixamo) while others cannot. Furthermore, if you use these methods, you may need to reduce the number of polygons in your original mesh to make it suitable for use in Unity. Purchase demo examples and character content from the Unity Asset Store. You can also prepare your own character from scratch by following three steps: modeling, rigging and skinning. Use a topology with a well-formed structure. The exact nature of a “well-formed” structure for your Mesh is rather subtle but generally, you should bear in mind how the vertices and triangles of the model are distorted as it is animated. A poor topology does not allow the Model to move without distorting the Mesh. Study existing 3D character Meshes to see how the topology is arranged and why. Check the scale of your mesh. Do a test import and compare the size of your imported Model with a “meter cube”. The standard Unity cube primitive has a side length of one unit, so it can be taken as a 1m cube for most purposes. Check the units your 3D modeling software uses and adjust the export settings so that the size of the Model is in correct proportion to the cube. It is easy to create models without any notion of their scale and consequently end up with a set of objects that are disproportionate in size when you imported them into Unity. 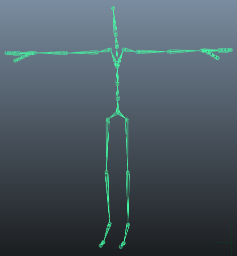 Arrange the mesh so that the character’s feet are standing on the local origin or “anchor point” of the model. Since a character typically walks upright on a floor, it is much easier to handle if its anchor point (that is, its transform position) is directly on that floor. 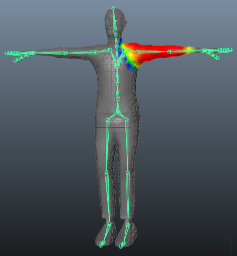 Model in a T-pose if possible. This gives you space to refine polygon detail where you need it (such as the underarms). This also makes it easier to position your rig inside the Mesh. While you are building, clean up your Model. Where possible, cap holes, weld verts, and remove hidden faces. This helps with skinning, especially automated skinning processes. This is the process of creating a skeleton of joints to control the movements of your Model. 3D modeling software provides a number of ways to create joints for your humanoid rig. These range from ready-made biped skeletons that you can scale to fit your Mesh, right through to tools for individual bone creation and parenting to create your own bone structure. To work with animation in Unity, make sure they are the root element of the bone hierarchy. A minimum of fifteen bones are required in the skeleton. This is the process of attaching the Mesh to the skeleton. Use an automated process initially to set up some of the skinning (see the skinning tutorials available for your 3D modeling software). Create a simple animation for your rig or import some animation data to act as a test for the skinning. This should give you a quick way to evaluate whether or not the skinning looks good in motion. Incrementally edit and refine your skinning solution. Limit the number of influences when using a soft bind to a maximum of four, since this is the maximum number that Unity supports. If your Mesh uses more than four influences, then you lose some information when playing the animation in Unity. Export the Mesh with the skeleton hierarchy, normals, textures and animation. Re-import the Mesh into your 3D modeling software to verify your animated Model looks as expected. Export animations without the Mesh.